Anita King ’37 at her home in Williamsburg, MA. King’s interest in people and the planet that have helped her shape the lives of countless others. 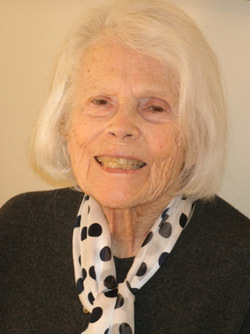 At 95, King recently retired from her post as chair of the population program for the Massachusetts chapter of the Sierra Club. In that role for 15 years, she’s worked ardently to help people understand the correlation between population stabilization, the survival of natural resources, and women’s health and education. 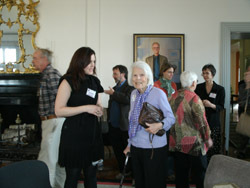 On April 21, about fifty people came to a reception at the Alumnae House to honor King’s career. In addition to her Sierra Club position, King also served on several other boards, including the Women’s International League for Peace and Freedom and the New England Coalition for Sustainable Population. Up until just a few years ago she was also practicing family therapy, and was trained by Salvador Minuchin, a pioneer in this field. In her role with the Sierra Club, King taught students to contact Congress for increased funds for family planning, reproductive health, and AIDS prevention abroad, as well as addressing environmental issues such as better auto standards and eliminating diesel fuel in school buses. And starting in 1994, King was responsible for bringing 20 influential guest speakers to Smith. She sponsored lectures initially through public donations and some funds from the Five Colleges. For years she was connected with the Project for Women and Social Change at Smith, chaired by Myron Glazer, and more recently, she worked with Joanne Benkley, the coordinator of Smith’s Environmental Science and Policy program. 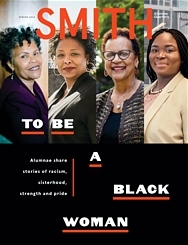 “I have been amazed and inspired by Anita’s persistence in fighting for what she believes in, by how much she has given of her time and energy, not only in reaching out to Smithies but also to the surrounding communities, to try to make the world a better place,” says Benkley. In April 2011, King retired as chair of the population program for the Massachusetts chapter of the Sierra Club. King’s persistence paid off in many ways, particularly in bringing to Smith such influential speakers as Margaret Catley-Carlson, the chair of the World Economic Forum Global Agenda Council on Water Security, and Thoraya Obaid, the executive director of the United Nations Population Fund. King cites Catley-Carlson as one of the most important presentations she has arranged, since water is a major environmental and population issue. “Roughly one billion people do not have clean water, and the second problem is lack of sanitation. As a result, approximately 4,000 children die every day, mostly from diarrhea,” says King. “This is going on while the United States is spending $10 billion a month on a foolish war in Afghanistan,” she adds. King says she has always worked and was very fortunate to have good jobs. Her desire to work and give back was instilled by her parents; her mother was a role model at a time when women didn’t necessarily pursue careers. When her father had heart problems, King’s mother took a course and went on to earn a living for many years as a decorator in New York City. Always doing work she has enjoyed is one main reason King believes she’s been able to live such a long and fruitful life. “What an inspiration,” says Leslie Laurie, the president and CEO of Tapestry Health, who was delighted to attend King’s retirement party. Laurie remembers when King was Laurie’s first paid staff member years ago. Ask Congress to increase funds for international family planning and reproductive health. Ask Congress to send students abroad to teach literacy, methods to purify water, and ways to develop sanitation.